Icelandic Opera's new production of Tosca mixed local and foreign talent. The production team was led by Ireland-based Australian director Greg Eldridge with set designer Alyson Cummins, costume designer Natalia Stewart, and movement director Jo Meredith, and the leading lady soprano Claire Rutter, who plays Tosca, is British. The rest of the cast is Icelandic, with Kristján Jóhannsson as Cavaradossi, Ólafur Kjartan Sigurðarson as Scarpia, Ágúst Ólafsson as Angelotti, Þorsteinn Freyr Sigurðsson as Spoletta, Fjölnir Ólafsson as Sciarrone and Bergþór Pálsson as the sacristan, conducted by Bjarni Frímann Bjarnason. The production opened at Harpa in Reykjavik on 21 October 2017, and we caught the performance on 5 November 2017. Harpa is more strictly a concert hall than opera house, it offers a fixed stage area with lighting rig but with no wing or flies, and for Tosca no drop curtain. Alyson Cummins' set design took a number of fixed elements which were configured very effectively for each scene, pillars, a stained glass window, monumental doors and railings, making the most of the height of the space. Though Greg Eldridge's production was set in the 1920s it had a very traditional feel, but within this context there were a number of details where Eldridge was clearly trying to re-think things. 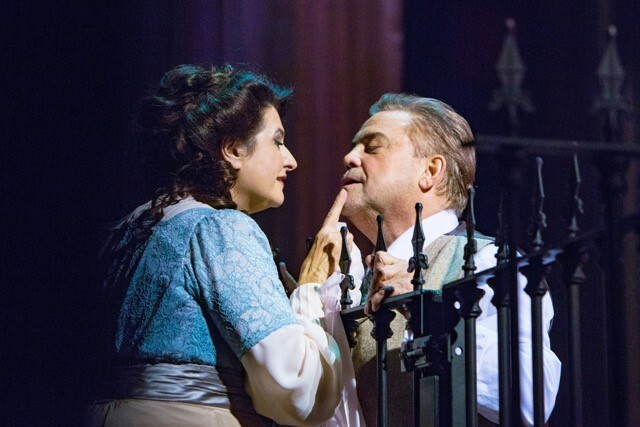 And whilst the general look and feel was 1920s, Tosca's costumes were rather defiantly pre1914 in style. The context for the production was the 1922 March on Rome by Mussolini and his Blackshirts. Technically the march failed, but in the end King Vittorio Emmanuele III capitulated and handed control to Mussolini (which provided the historical context for the opera's reverses in political fortune). The opera opened with the church occupied by partisans with a death to Mussolini flag, and interesting details which Eldridge brought to the production included Tosca's first entrance as a staged 'diva moment' complete with photographers, the sacristan playing a larger role than usual in the opera as one of Scarpia's minions and Scarpia's apartment in Act 2 having a large amount of monitoring equipment. The final act took place with a public audience for the execution, when a number of prisoners were shot including a child. But the biggest change was that Scarpa was a senior member of the Church, Tosca repeatedly kissed his ring, and his henchmen and entourage were mainly churchmen. When Tosca has killed Scarpia at the end of Act Two, she does not place candles beside him but covers his corpse with his cope. I am a little uncertain about the idea of having Scarpia as part of the Roman Catholic Church, using his position for his own venal ends. Part of Scarpia's power, surely, is the way he has risen to power through force of personality, in opposition to the church. With a relatively straight-forward set, Eldridge did not attempt anything too complex for the end of Act One, the West end of the church was facing us so for the Te Deum the cast simply assembled and faced us (the notional altar). It was a relief to have blocking which, for once, wasn't liturgically risible and generally made some liturgical sense. 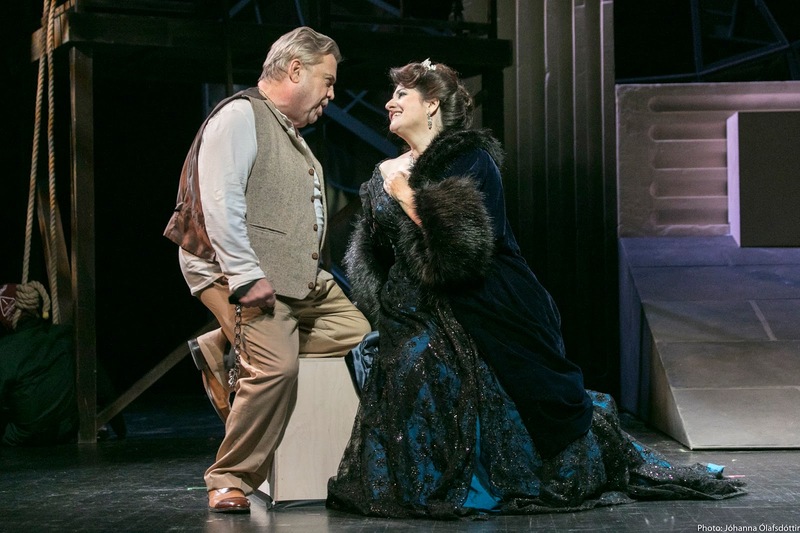 Claire Rutter made a mature, diva-ish Tosca, often on her dignity and constantly needy of reassurance from Cavaradossi, yet capable of girlish moments too. The way her face gradually registered the price she would have to pay Scarpia spoke volumes. Rutter has recently sung her first staged Sieglinde (at Grange Park Opera, see my review) and her voice easily rode the climaxes. But she kept a nice amplitude and evenness of phrasing and refined control. 'Vissi d'arte' was quite intimate, with the singer alone on the stage. There was also a real strength of character which allowed her to contemplate making the sacrifice of her virginity to Scarpia. Kristján Jóhannsson as Cavaradossi was obviously a great local favourite (he made his Covent Garden debut in 1994 in Aida) and all his arias drew tumultuous applause. He has a fine Italianate voice, perhaps a little frayed at the edges, but an unfortunate tendency to sing nearly everything at a steady forte rather took the edge of the enjoyment. Conductor Bjarni Frímann Bjarnason seemed to follow Jóhannsson's lead so a number of the big moments in the opera were too loud. That said, whilst Jóhannsson's acting was somewhat old-fashioned, it was nonetheless effective. 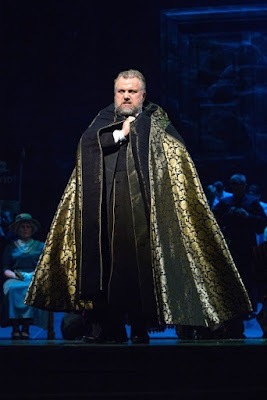 He and Claire Rutter made a fine and very convincing team, and Jóhannsson's Cavaradossi was clearly enjoying himself taunting Scarpia in the opening scenes of Act Two. Ólafur Kjartan Sigurðarson, familiar to London audiences for his roles with Opera Holland Park, made a strong Scarpia. A born manipulator, this Scarpia clearly enjoyed using the power of his position for his own ends. Sigurðarson's voice easily rode the orchestra at the end of Act One, as it should, and in Act Two he and Claire Rutter really did make the air crackle, and it was clear that this Scarpia was relishing manipulating her. Þorsteinn Freyr Sigurðsson was quite a non-traditional Spoletta and Fjölnir Ólafsson very much a career priest as Sciarrone; both were creditably promising with nicely musical performances. Both singers are quite young and faced with a trio of such strong (and at time loud) principals, neither Sigurðsson nor Ólafsson quite registered to the degree they ought. Bergþór Pálsson's sacristan was a little too much the comic turn in Act One, though he rightly dominated the first scene. Ágúst Ólafsson's Angelotti was a classic tortured prisoner whilst Tomas Haardie made a serious jailer in Act Three. The role of the shepherd boy was taken by Sigurbjartur Sturla Atlason, evidently better known as hip-hop artist Sturla Atlas, who sang the shepherd boy's song falsetto in a distinctly non-operatic manner. One notable non-singing role was Stefán Freyr Michaelsson as Roberti the torturer, a real muscled Viking who had a striking stage presence. The choir of Icelandic Opera and the Reykjavik Boys Choir made a larger contribution than usual, as well as their lively performances in Act One they returned as prisoners and spectators in Act Three. Under Bjarni Frímann Bjarnason the orchestra gave a strong performance. I liked his general approach, with an overall urgency tempered by the freedom he allowed his principals. Iceland is a relatively small country (population less than 350,000) and this production with a mainly Icelandic cast was a notable achievement. 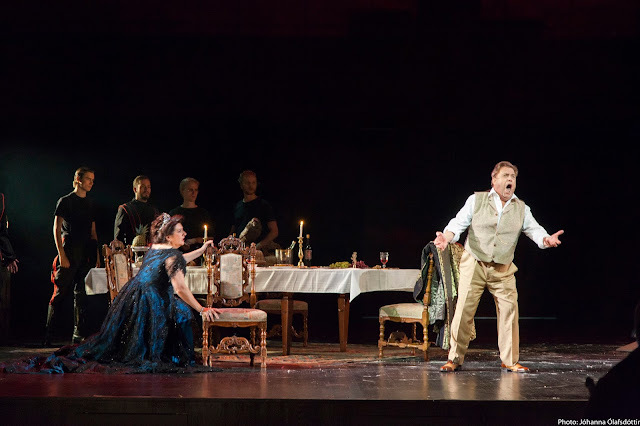 Eldridge's staging had a nice reliance on the traditional shape of the opera with a welcome tendency to re-think things whilst avoiding change for its own sake.